This is a fast+lame attempt at making a simple Twitter addon for OpenFrameworks. It is based on various discussions found on the OF forum, but specifically on this article from Paul Shen : openFrameworks + HTTP requests + XML parser. We are using this addon for some installations we are preparing for Lift’11. To install, unzip+copy the ofxTwitter folder into your « addons » folder in OpenFrameworks. 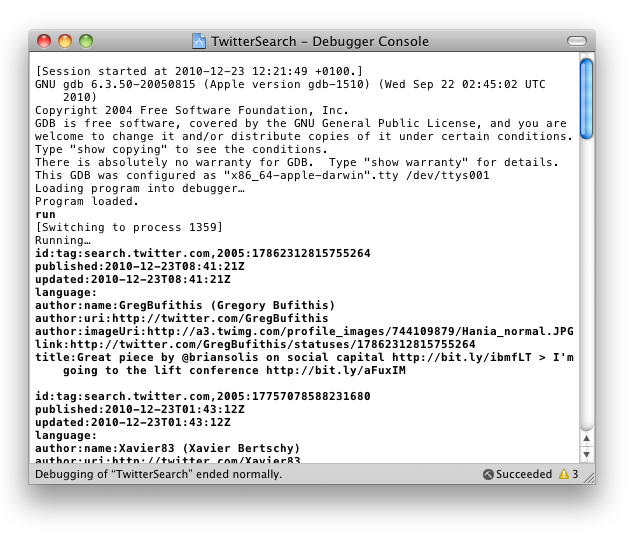 Then unzip+copy the TwitterSearch example into your « addonsExamples » folder in OpenFrameworks. If you start from a new OF project, you will have to drag the following addons into your project usually these are placed in the « addons » folder inside Xcode: ofxHttpUtils, ofxThread, ofxTwitter, ofxXmlSettings. The example is Xcode (Mac OS X) only for the moment. When I’ve cleaned it up and run it through its’ paces, I’ll release it as a true OpenFrameworks addon via GitHub.